What was the commercial outcome of your last film Leader? Leader was made on a budget of 13 crores. It has collected a theatrical share of 10 crores and made 3 crores on satellite rights. It was a safe project. Leader film had everything going against it compared to commercial flicks. It has no comedy, no romance and the subject was politics and politics are always playing on TV channels. Despite that it made a theatrical share of 10 crore rupees. I feel that minimum market for my films is 10 crores of theatrical share. How much was Happy Days was sold for and how much did it make? Budget of Happy Days film was 3 and half crores and I sold the entire AP theatrical rights to Dil Raju for 5 crores. I don’t know the exact share, but it is believable to be around 20 crores. You are known as a clean director. Why is that your film is awarded U/A censor certificate for the first time in your career? The rules of censoring are becoming stringent year by year. To show the difference between households of rich and poor, I kept a few liqour bottles in the foreground of rich houses and I guess U/A ceritificate is given for that reason. It’s kind of funny. There are no visual cuts in the film. But I voluntarily had a few audio cuts. How many days did you spend on script of Life is Beautiful? Once I decide on genre and basic story outline, it usually takes 3 months to write complete script. All my films took 3 months each to write except for Leader. I felt that Leader film was the need of hour and quickly scripted it. It took only 2 weeks to write Leader script. How come we have an ‘Aunty’ concept in LIB? Every teenage boy goes through a phase where one starts giving more attention to any attractive lady in the neighborhood. There is no embarrassing moments in LIB regarding aunty character. The aunty character in LIB will be as clean and as glamorous as lecturer character in Happy Days. I happened to see the latest TV commercial of Nirma and liked Anjala Zaveri. I tracked her down and signed her. There is Happy Days flavor in LIB. Is it intentional? Yes. The flavor is same. Happy Days happens in a college and LIB happens in a colony. You feel nostalgic about your colony once you lived in after you watch LIB. It’s colorful, full of fun and festive. Like in Happy Days, this film too is assisted by perfect casting. Like Happy Days, LIB too has lot of association with middle class families and middle class youth. What is the budget and sales of the film? LIB is made in a budget of 8.5 crores (excluding my remuneration). We sold it in such a way that distributor is comfortable by keeping my guaranteed market share of 10 crore in mind for Andhra Pradesh region. MAA TV has paid 4 crores as satellite rights. USA rights are sold for over 1.5 crores much before the shoot was begun. LIB was shot in 144 working days and the runtime is 2 hours and 46 minutes. Can you tell about growth of your brand in USA? We had sold Anand for 12 lacs and we got another 3 lacs after the release. We sold Godavari for 25 lacs. Happy Days was sold for 65 lacs. We sold Leader for 1 crore. Life Is Beautiful was sold for 1.5 crores much before start of shoot. MAA TV has started off buying films with Anand. The chairman at the time - Murali Krishnam Raju called me and asked me how much I was willing to sell it. At that time Anand was running successfully on 25th day. He also said that he wanted to buy Anand because their first film will have the first alphabet. I proposed 30 lacs and gave the rights of my national award winning ‘Dollar Dreams’ as a compliment. Godavari film was sold for 70 lacs to Zee Telugu. MAA TV has brought Happy Days for 1 crore. Leader was sold for 2.75-3 crores to MAA TV. It was clubbed with Suriya’s Veedokkade and Leader share comes out to be 2.75 to 3 crores. 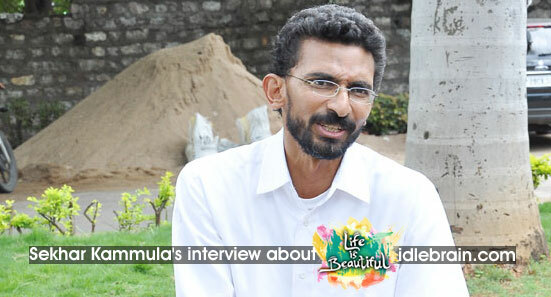 Life is Beautiful was sold to MAA TV for 4 crores. Anand film was released with six prints in Hyderabad (3 prints), Vizag (1), Vijayawada (1) and Warangal (1). Godavari was released with 35 prints. Happy Days was released with 100 prints. Leader was released with 150. Life is Beautiful is releasing with 300 prints. I have many options. But I aim to release my next film in an year from now. Let us see if I can make it.